Here's a yummy BPI Real Thrills promo! 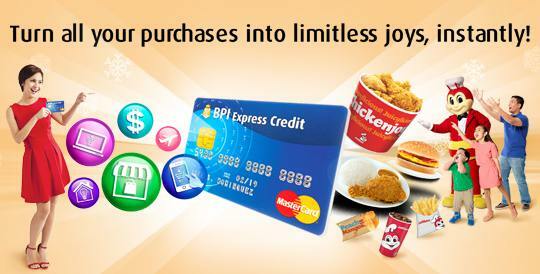 From October 1, 2015 to January 1, 2016, you can exchange qualified transactions using your BPI credit card with corresponding Jollibee meals. See table below. 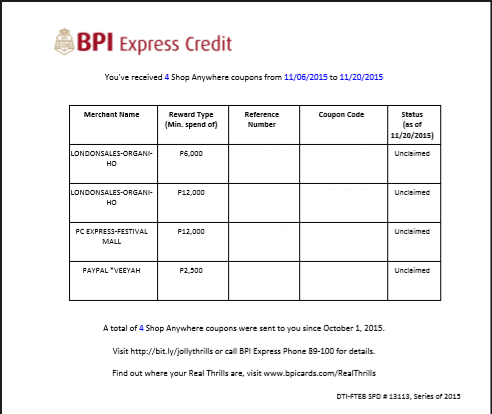 To be eligible for the promo, you need to register your BPI Express Credit customer number which can be found on your billing statement in print or online through email or text. These should be the same as the principal card holder's contact details on the system. If not, call BPI to have it updated. Successful registration will be confirmed within 2 business days. Below is a sample of Shop Anywhere coupons earned. Actual coupon codes and reference numbers are erased for security purposes. I was already able to redeem the lowest valued coupon with no problems. Only the coupon code was needed so there's no need to print out the file. Just take a screenshot of the page and show it a Jollibee branch to redeem the meal. For more details about the promo including registration and redemption, see http://www.bpicards.com/realthrills/items/35 .